We were on the road recently in Ventura, California, and we jumped at the opportunity to grab a legendary In-N-Out Burger. This wasn’t a new thing for us, but some of our friends had never tried these delicious concoctions. As you cans see from the photos, we went with the Double-Double burgers. It looks like many double hamburgers you’ll find today at other fast food spots, but the taste of this burger surpasses all of them and lives up to its legendary status. You can taste the quality of this burger, as you won’t find one sitting under a heat lamp. They use fresh beef and have their own patty making factory. By focusing on burgers and not cluttering the simple menu with chicken or other options, In-N-Out can deliver the goods over and over again. While the burger was amazing, the French Fries were average at best and the shake was nothing special. Everything here revolves around the incredible burgers. 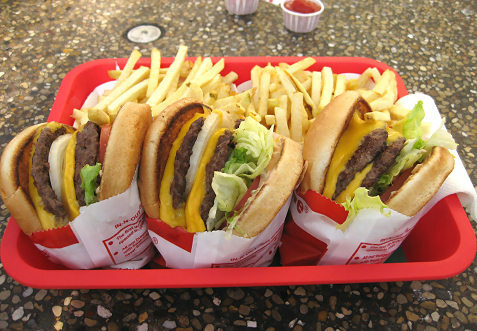 Another thing to keep in mind is In-N-Out Burger’s not-so-secret secret menu. You’ll see from the pics above that the official menu at In-N-Out Burger is very simple. Over the years, loyal fans have order all sorts of variations and some of them have become staples for customers who goes there regularly. The company published their own guide to some of these “secret” menu items here, and here’s one of many blog posts on the topic. If you don’t live on the West Coast you’re SOL on this one. Just make sure you try them when you head out West. Domino’s new wings and boneless chicken. Mmmm Good. Bullz-Eye tested the new Domino’s boneless chicken wings and regular chicken wings to see what all the hype was about. Our friend Phil over at Domino’s sent over a variety of different samples and we filled up on some good fair! Ever since the new Domino’s pizza hit the market last year we have been interested in the transformation at Domino’s and even took a trip to visit Domino’s headquarters in Michigan to get a behind the scenes look at what Domino’s did to change course with a vastly improved pizza. Ok, This post is about the new Domino’s chicken wings so let’s get back on track. 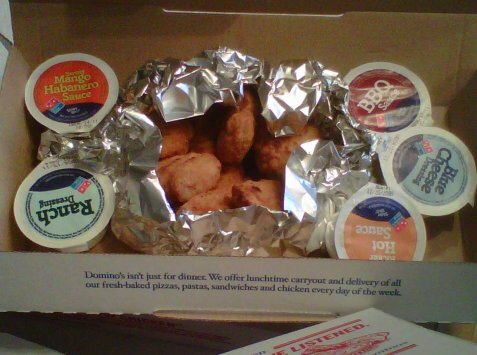 Domino’s sent over both boneless chicken and regular chicken wings in Hot, BBQ and Sweet Mango Habanero. The Domino’s chicken is billed as the next chapter in the Domino’s story of reinvention and we are happy to report this chicken is very good. My fellow chicken wing fanatics and I first noticed how tender the chicken was on the wings. Lean and tender was the best way to describe the new Domino’s wings and the flavors are vibrant and accurate. The favorite was the Sweet Mango Habanero and when dipped in the provided Ranch or blue cheese containers forget about it! The new boneless wings are made with 100 percent whole white breast meat lightly breaded with savory herbs and they are simply delicious! The boneless chicken are not covered in sauce but rather they come with dipping sauces consisting of hot, BBQ and new Sweet Mango Habanero and of course ranch or blue cheese for dipping. All of the flavors were very good but again the new Sweet Mango Habanero ranked # 1 with our group. Domino’s appears to have more winners on their hands (including alot of flavored sauce – ok just reached for a napkin and I’m good) and we look forward to getting our grub on with the new Domino’s all white breast meat boneless and regular wings while watching a good sporting event on the big screen. Hey, It’s the American Way! Don’t forget to check out the Domino’s Pizza Bracket on Facebook. The company is down to the Final Four pizzas, competing to become the fan favorite pizza champion. All guys (ones that I know anyway) love a good burger! 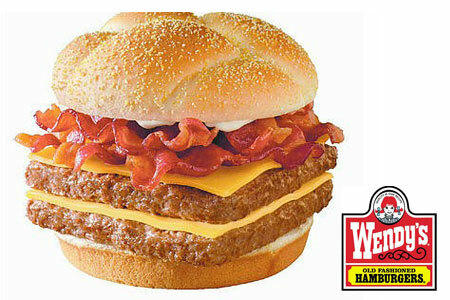 If you are looking for the ultimate guy’s burger, then look no further than the Wendy’s Baconator Triple. I say the ultimate guy’s burger because I can’t imagine any sane woman wanting to eat such a huge burger unless she was answering to a dare or a lost bet. The Baconator Triple sports three 1/4-pound fresh, never frozen patties, 3 slices of cheese, 9 smoked bacon strips, mayonnaise, ketchup, mustard, 4 dill pickles, onions (4 rings), 2 slices of tomatoes, lettuce and a premium bun. All that good American dish for a staggering 1360 calories!! You also have the option of “personalizing” your Baconator for even larger stats. Hey, Wendy’s didn’t create this beast for the faint of heart or those counting calories, and as long as you know what you want and how to handle it, this is one great burger! Since McDonald’s launched the McGriddle breakfast sandwich back in 2003 I still haven’t found anything that compares when it comes to taste and convenience. You see the beauty of a Sausage, Egg & Cheese McGriddle is you get the great taste of pancakes with the hearty bite of an omelet. It’s important to give yourself plenty of fuel before a long day at work, and the McGriddle can do just that. If you think an apple or a granola bar can hold you over till lunch, you might be sorely mistaken, aching for some sustenance before long. The soft and warm pancakes buns with maple flavoring really set off this fast food masterpiece for guys on the run like myself. If you haven’t tried a McDonald’s McGriddle yet you’re missing out on a great breakfast wrapped in a very good price. 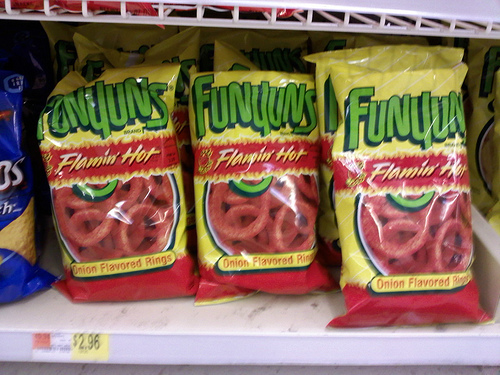 Funyun’s Flamin’ Hot Onion Flavored Rings–Another extension of the Frito-Lay “Flamin’ Hot” franchise, complete with the red glow that works its way onto your fingers as you eat them. I love Funyun’s, and I love spicy food, so this was a slam dunk for me. I could probably eat 10 bags of these right now. Chee-tos Giant cheese puffs–If Eric Cartman were a real person, he would eat these. We’re talking balls that measure one inch (some more) around, that for some folks would require two bites. The novelty alone was worth trying them for, but it’s not like you’ll want to sit around and munch on these. They taste fine, but when you eat the smaller variety, you get more cheese flavor all around. Chee-tos Mighty Zingers Sharp Cheddar & Salsa Picante–Unlike the Giant puffs, these are the “fried” variety of Chee-tos. The “sharp cheddar” flavor are indeed nicely cheesy with just a bit more sharp bite than regular Chee-tos. And the salsa picante ones, which are the same color as the Flamin’ Hot snacks, have a hint of cheese but a more prominent salsa flavor–and an authentic one at that, in which you can taste both tomato and a hint of onion and hot peppers. Together these two flavors in one bag go together like peanut butter and jelly. No joke! Lay’s brand Kettle Cooked Jalapeno Flavor Chips–Well, I’ll admit I’m not a huge fan of kettle cooked (i.e. extra crispy) potato chips. But hey, if I had a choice, I’d still rather eat a chip than a stalk of broccoli. So I dug in to these, and while they have a super crunch and a nice jalapeno spice, there is too much onion powder in these chips that overpowers them. Not only that, after eating a nice handful, I had onion breath and dry mouth for the rest of the day. Doritos Late Night Tacos at Midnight Tortilla Chips–If you, like me, are old enough to remember when Doritos first came out, this one will take you back. Back then (I think maybe in the ’70’s? ), they had plain corn, taco flavor and nacho cheese. And my favorite by far was the taco flavor, which they stopped making after a while, brought back and then stopped making again. Now it’s back disguised as this “Late Night” version, which is every bit as good as the original Taco flavor and then some. In fact, you can almost close your eyes here and feel like you’re eating a fast food taco. And we all know how great those taste after a few beers, so the “Late Night” tag on these is an arrow through the hearts and taste buds of those who troll the convenience store aisles late at night. Seriously though, these chips are just awesome, even in the middle of the day. I hope you had as much fun reading this as I did eating and writing. But I don’t know how that’s possible, so go try some!